I finished working on a new commissioned miniature petit point rug, IZMIR. 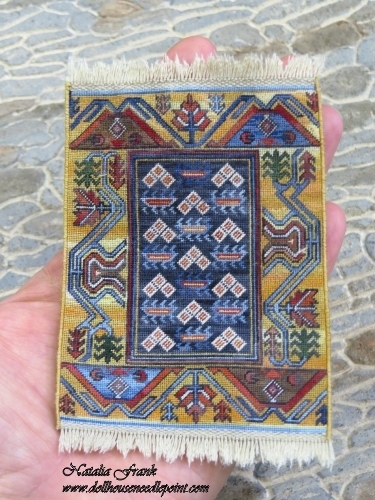 This is a reproduction of an antique rug, 18 c. The original rug is at the Turk ve Islam Eserleri Museum, Istanbul. I used 48 count silk gauze and Gloriana over dyed silk floss. It took me 4 nonconsecutive weeks to finish it. For some reason, yellowish color looks brighter on the picture, however, in real life it is dull. I hope you like my new creation.